Listening to market requirements for the high quality facades Knauf has invested into a completely new production facility within Knauf Zemun factory. This investment has brought refreshment in the local market when it comes to new production technologies for façade plasters and colors, primers and mosaic plasters. The capacity of the new facility is 7.500 tons of pasty products per year. In cooperation with Knauf Development Center form Iphofen, Germany we have created façade products which are certified by ETA. This most respectable European document for façade system testing confirms compatibility, efficiency, resistance and certainty of façade products. 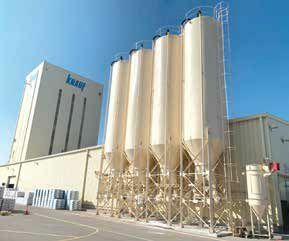 Knauf partners and installers have already approved new products and its quality is confirmed with zero claims since the beginning of production. Expanding the Perfect Surfaces portfolio Knauf Zemun has made a new finishing compound for March 2019 called Biofinish Plus. As a result of a solid market research, this product was made to meet the requirements of the most demanding professionals. The existing product Biofinish has already conquered Serbian and local markets, and became a respectful brand among installers. Its Plus variant will have additional characteristics, such as machine application and hardness. The new product will contribute further sales growth and increase of market share. With application of Finish Grund primer Knauf Zemun has made a complete system offer in the finishing compound products market.